Cheesy bacon potato brunch bake! Oh yes, this one is close to my heart. I can just picture this with a couple of over easy eggs all mushed on top. Well, actually, you could have this with anything. I can see pork chops with this too, oh wait....I can just serve this as an appetizer during the game! Yes! What will you make it with? Toss the potatoes and onions together with butter, seasoning salt and pepper. Divide the sliced potatoes and onions equally between a few large pieces of heavy-duty foil that have been sprayed with cooking spray. 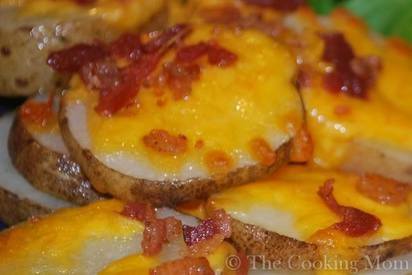 Sprinkle cheddar then Parmesan cheese over the top on potatoes. Then top with bacon. Bring opposite ends of the foil together and seal to form a packet. Place on grill over medium heat for about 25 to 40 minutes or until potatoes are fork-tender. Remove from grill, carefully open the packets. You can also bake foil packets on a large baking sheet in a preheated 350 degree oven for 25 to 40 minutes.